Rats enjoy playing games with other rats, with toys and with people. 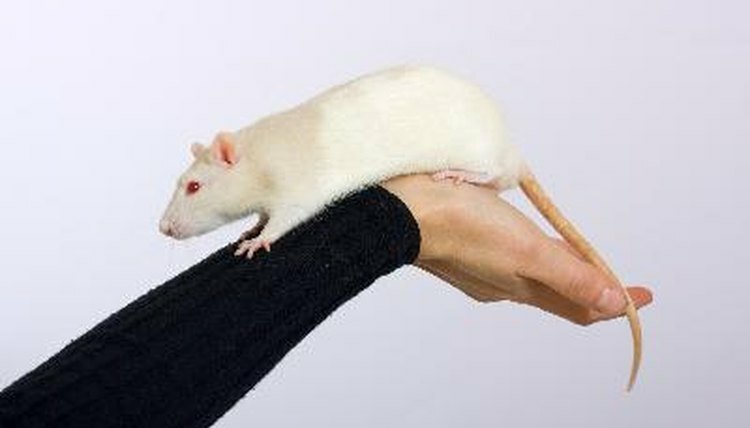 Establishing a trusting relationship should come before you initiate active play with your rat. Rats are very intelligent and curious, and they tend to learn quickly. Providing mental stimulation through play and training will enhance the rat’s natural intelligence. Use positive reinforcements such as praise and little treats. Once your rat seems comfortable being held and is happy spending time relaxing on your lap or riding on your shoulder, you can begin playing games. Pay attention to cues and stop playing a game your rat does not like, and remember that, although they are feisty, rats are small and can be easily hurt. In the beginning, make a game of teaching your rat to come when called. After she learns to take food from your hand, you can start saying her name before giving her a treat. Move your hand and the treat a little farther away each time you say her name, and when she comes to you, give her the treat. Eventually, she will learn her name and come when you call her. Baby rats play with each other by chasing and wrestling. You can join in by putting your hand inside the cage and pretending your hand is a rat by imitating their movements. Playing games on her territory is a good way to bond with your rat as she learns to trust and accept you. Rats can learn how to play interactive games such as peek-a-boo, hide and seek and tag. Try tearing paper into strips and giving your rat one piece at a time. She will grab the paper, stash it away and return for more. This is not only fun, but it teaches your rat that you have and want to share treasures she enjoys. Rats will play peek-a-boo with you, and when you hide or duck behind a chair or couch, your rat might look for you and get excited when you suddenly appear. Paper bags intrigue some rats who are attracted to the rustling noise they make when you scratch or crumple them. Let your rat run in and out of the bag, pounce on it or sit inside while you pull the bag around. You can make mazes and obstacle courses out of cardboard boxes or tubes taped together. Rats are climbers too, so you can stack the boxes up, as long as the climbing structures are sturdy enough to not to collapse under your rats' weight. If you are feeling ambitious, try putting together or building an agility course and teaching your rat how to master jumps, hoops, see-saws, ramps, weaving poles and tunnels. Use treats or moving objects to lead her through the course or maze. Rats will instinctively chase something that moves quickly, so get her excited about trying to catch string, feathers or small crumpled balls. Thrift stores that sell used toddler toys are excellent places to shop for props you can use to create spaces that will entertain your rat. Look for plastic houses, castles, towns, farms, planes, buses and other buildings or vehicles. Examine toys for any sharp edges, small loose parts or other potential dangers, and clean the toys before you let your rats play with them. A large table she cannot fall off, the couch or a playpen are surfaces on which you can create a town, a playground or a world for your rats to discover. Rats will explore, hide food or build nests to take naps in farms with silos, castles with balconies and houses with stairs. Every once in awhile, redecorate, move the buildings around and add or take away toys to make each experience new and exciting. Pea-fishing is an excellent summer game for rats. Put a plastic cloth or tarp on a table, then take a bag of frozen peas, and put a handful into a shallow ceramic or glass container of tepid water. Add some large smooth rocks for your rat to climb on. Show the rats their pool, and enjoy their fun as they jump into the water and dive for peas, or sit on the edge feeling for peas with their front feet, or just lie in the water and eat the peas they retrieve. Rats like dirt and will dig in your house plants if they find them, so giving them a digging box full of sterile soil will allow them to dig and forage without ruining your plants or eating something poisonous. Put a large towel or outdoor tablecloth on a flat surface, add soil to a box, bury treats or toys into the dirt and put your rats into the box. This game can be just as entertaining for you as it is for your rats.